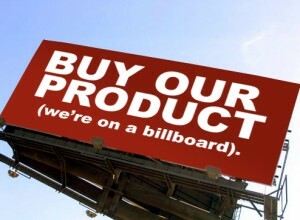 Advertising is a key element in the operation of a business. People learn about new products, special item sales and clearance sales through advertising. Entrepreneurs know that the key to selling products is to let buyers know that the products they need and want are available at reasonable prices. Since many people sell similar products, advertisers realise that the best chance for selling a product is to find an interested buyer. Therefore, some advertisers specialise in compiling lists of targeted customers. They know that sending advertisements to uninterested people is a waste of time and money. In addition, if they can guarantee a targeted list, they can charge more for advertising. Finding a targeted buyer is only the beginning. It’s true that if the product is really good, it will sell itself. However, with many competitors trying to sell to the same buyers, advertisers must be more innovative. They must have more than a picture of the product, and a sign that says “Buy this!” to succeed. They must use their imaginations and modern technology to present their products in an engaging manner. Two technological events have made the advertisers’ dreams come true, by revolutionising advertising. They are the Open Internet Exchange and Phorm Technology. Modern technology has created the perfect showplace for the computing and electronic industries. The Open Internet Exchange places the buyers and sellers in an area that belongs to them. It is the perfect place to introduce new products and sell old products at a reduced price. In addition, it is the businessman’s dream because it offers the opportunity to reduce costs of manufacturing and purchasing. It increases the efficiency of supply chain management. Advertisers who insist that their targeted customer list be valid have the perfect guarantee with u-phorm.com. In order to access this site, you would use the site name. However, if you are randomly searching for sites related to education, schools, training, types of learning and other similar subjects, your profile suggests that you are interested in education. Since u-phorm.com specialises in kinesthetic learning, you will discover the various ways that they combine learning with physical activity. Without knowing it, you have become a member of the targeted group. With the presentation of their ad, you may decide to take advantage of the training, or you may ignore it. Phorm has contracted with Internet Service Providers to offer a program that tracks a user’s browser to compile user interest content for advertising. The program is free, but the user must choose to use it. When the program is chosen, a random number is attached to the user’s browser and used to track every website that the user visits. After the user’s interest content is compiled, the user is given the latest information about his search. The web is searched for news stories, blogs and videos so that the user may access the latest information available.